Get ready to ride and help put a stop to hunger! 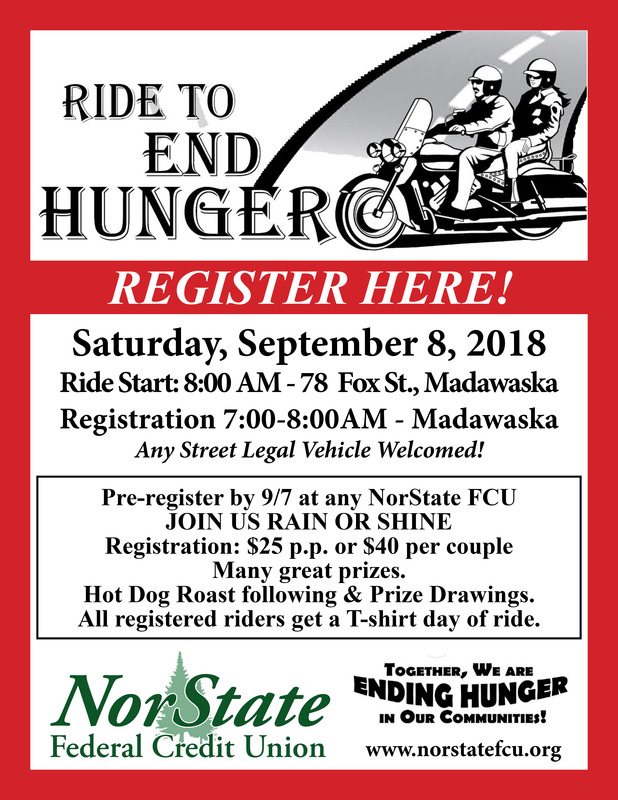 NorState Federal Credit Union’s 2018 Ride to End Hunger will start at 8:00 a.m. on Saturday, September 8, at the Madawaska NorState office located at 78 Fox Street. Registration is from 7:00 am to 8:00 a.m. the morning of the event or riders’ can pre-register at any NorState location before September 7. Rider registration is $25 per person or $40 per couple and all registered riders will get a Ride to End Hunger T-shirt. The ride will encompass all 6 locations of NorState FCU from Madawaska to Fort Kent, Eagle Lake, Ashland, Presque Isle, Van Buren and back to Madawaska for prize drawings after the ride. A hot dog lunch will be served immediately following the ride. All proceeds to benefit food pantries in Central and Northern Aroostook. For more information about this food pantrieEnding Hunger fundraiser, call 800-804-7555 or visit us online at www.norstatefcu.org.